Jónas Pálmason, an auto-didact in seventeenth-century Iceland, has been banished to a small island, ostensibly for his religious beliefs, in reality for refusing to follow a local leader’s instructions to take part in a massacre of visiting whalers. As he sits on his cold, lonely prison in the Arctic Circle, he watches the natural life around him, spins yarns and fills the reader in on the story of his life. And it’s a very good one. 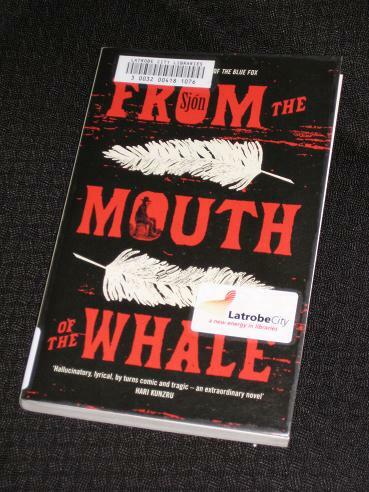 It’s actually quite difficult to really summarise From the Mouth of the Whale – it’s not that kind of book. It’s best to just sit back and read it, let the words flow over you and enjoy the magical twists and turns the narrative takes. The story begins with a short tale depicting the fall of Lucifer from a very different angle to the usual story, and it goes on from there, jumping from descriptions of the grim Icelandic countryside, to short encyclopaedic descriptions of plants, fish, birds and animals (both real and imaginary), to tales of myths and religion. Yes. I’ve heard nothing but good things about this book, which augurs well for its shortlist chances. The translation, as discussed, is excellent, and that is always an advantage. Sjón also made the IFFP longlist back in 2009 with The Blue Fox, so he has form, again a bonus. And he has a cool name. What more do you want? That’s all for this week – five down, ten to go. Same place, next week. OK with you? Yep fine with me, have read 4 of the list & this is my favourite by a long way & that it also is based on a real character altho not necessary makes an added bonus. I believe Victoria Cribb also translated Blue Fox making me want that as well. Yep, no doubt this is a gorgeous book and a strong contender. I would be very surprised and disappointed if it didn't make the shortlist. And I'm glad you highlighted the translation, because you're right, it's seamless. Mark – Definitely a shortlister, a possible winner (although I have got a couple of other favourites too now!). I started reading this, but I didn't find it exactly riveting. I guess I'll finish it, seeing as how I paid for the eBook. Someone should have mentioned God was involved. I'm not a big fan. Ooh, this sounds excellent. Thanks for bringing it to my attention. Violet – As I recall, He only has a cameo role 😉 It's definitely more about the style than the plot, but I suppose that's just the kind of book I like. Nose in a book – No worries – I'm sure you'll find a million other reviews on it now, especially if it makes the shortlist!